Masked anti-government protesters toppled the monument to Vladimir Lenin in Kiev on Sunday pulling him down with steel ropes, and smashing the granite figure with sledgehammers. A huge crowd queued to get a piece of the statue. 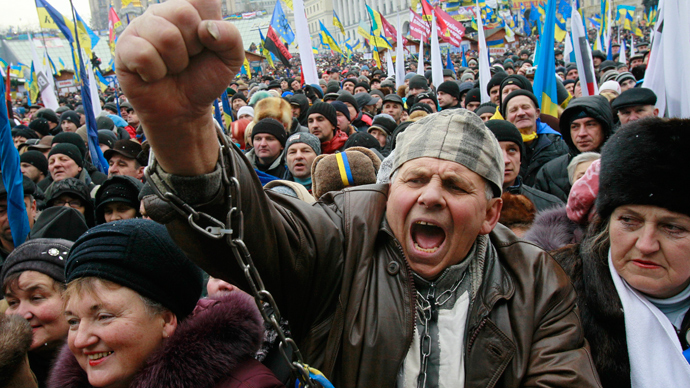 Follow RT's LIVE UPDATES on protests in Kiev. A group of protesters singing the national hymn of Ukraine then hoisted the national flag on the vacant pedestal, as the passing cars were honking in support of the act and jubilant cries were heard from the crowd. The activists shouted “[President Viktor] Yanukovich, you’ll be next!” while lighting flares and throwing smoke bombs next to the monument, Ukrainian media reported. 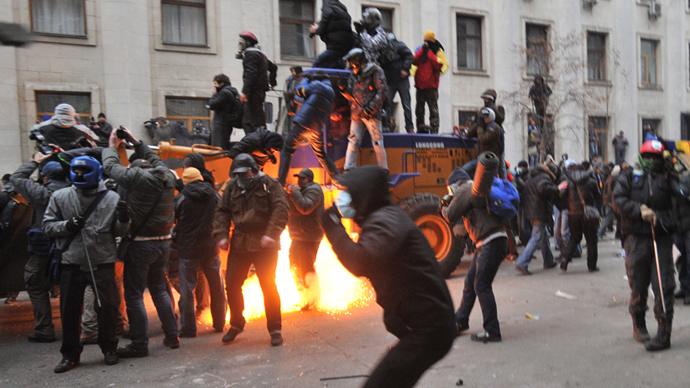 Security forces were absent from the scene at Shevchenko Boulevard. Local clerics also came to the scene “to smash Lenin,” RT’s Lida Vasilevskaya reported from the scene. 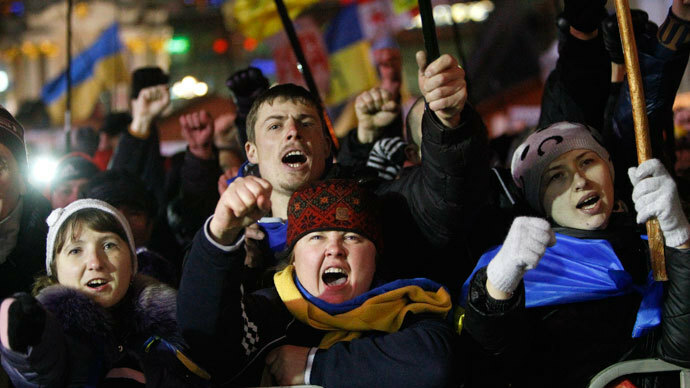 The furious demonstrators were holding red-black flags - the symbol of the far-right opposition party Svoboda (Freedom). However the party denied the responsibility saying it would be unfair to lay the blame on them. 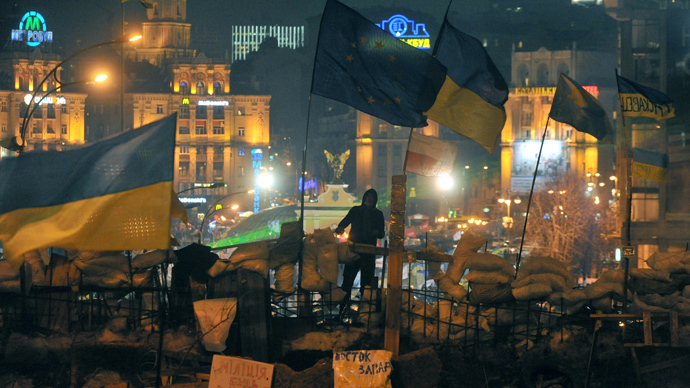 “Participants of Euro Maidan altogether toppled the monument, which was standing there illegally. There was a presidential decree [by former President Viktor Yushchenko in 2009] about its abolition,” said Yury Sirotyuk, the spokesman of Svoboda. Kiev police are investigating the monument’s demolition and the first detentions have already been made, according to the opposition Udar party official website. “They detain people who were just standing nearby and expressing a negative attitude to the Stalin-Lenin regime,” Valery Karpuntsov, an Udar MP claims, adding that the police did not try to stop the protesters from smashing the monument. This is the second time that the monument to the iconic communist leader has been attacked. On December 1, a group of pro-EU protesters tried toppling the statue with a similar tool. The riot police fended off the attack by dispersing the activists. The monument was erected in 1946 to commemorate the 10th anniversary of the constitution created by Soviet leader Joseph Stalin. Some Ukrainians view Lenin as an oppressor who deprived them of a state following World War I.